The main sightseeing object of the city is Niagara Falls – this unique natural landmark is now known literally to every inhabitant of the planet. For admiring the waterfall, many observation platforms and terraces are equipped. All of them are accessible to travelers. The most famous is the observation deck “Table Rock”. Several centuries ago, in its place, there was a huge flat stone, the Indians considered it sacred and carried out ritual activities at the site. In addition to admiring the beautiful waterfall, the city of Niagara is ready to offer its guests a lot of interesting entertainment. It is not for nothing that they call it “Canadian Las Vegas”, the choice of entertainment is really wide! Over time, the natural site collapsed, the last stone was removed a few years ago to avoid collapse. An artificial site was erected in place of the natural site, which is not at all inferior in scale but is safer. The symbol of the city is the so-called “Rainbow Bridge”, it passes over the waterfall and connects the American and Canadian parts of the city. There are a lot of great things to do in Niagara Falls! Are you ready for the virtual trip? Then, let’s get started! 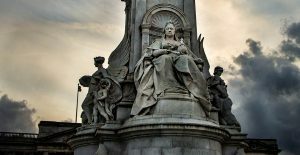 Lovers of natural attractions will be interested to visit the park, named after Queen Victoria. Its main pride is the collection of oriental ornamental plants. Queen Victoria Park consists of a large number of beautiful gardens with beautiful landscaped lawns and benches, where you can enjoy a pleasant pastime. By the way, the park is a good place for taking pictures. In the spring, the park fascinates 500,000 beautiful plants: daffodils, gorgeous magnolias, tulips and other spring flowers that create a good mood. In summer, cannes, fuchsias, roses, chrysanthemums and other plants grow in the park. In winter, the park hosts annual winter lights festivals. The park was opened in 1888. 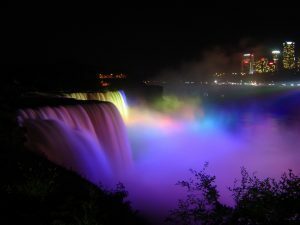 Now it is managed by the city of Niagara Falls and is considered the central tourist recreation area, located along the gorge of the Niagara River. Interesting: The park is an ideal observation deck with great views of the Niagara Falls. 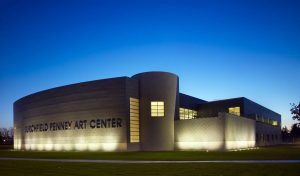 The art center, located near the famous Niagara Falls, will delight tourists with various works of art, among which, there are extensive collections of paintings and sculptures by famous Canadian artists. In the gift shop, you can buy books on art, as well as various reproductions that will be an excellent gift brought from Canada to their homeland. Interesting: The center operates from 9 am to 4 pm all year round. Near the building, there is free parking for all types of vehicles. The picturesque Oakes Garden Theater, located at the foot of Clifton Hill, is the perfect place for a relaxing, leisurely stay and enjoying a beautiful panoramic view. The garden includes such classical elements as the amphitheater, stairs, fountains, sculptures and sculptured bas-reliefs. 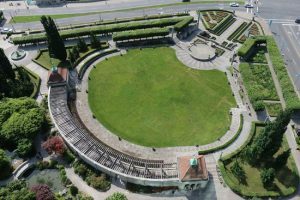 Interesting: The historically significant garden is a rare example of similar landscape architecture throughout Ontario and Canada. 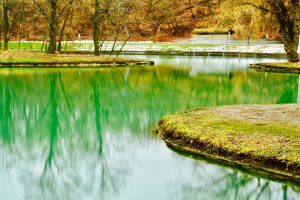 The quiet secluded park Dufferin Islands is a popular pastime – in the territory of more than 10 hectares, there are several small islands connected by bridges and paths. Interesting: From November to January, the park around the perimeter is equipped with several animated displays that serve as lighting. The Table Rock Welcome Center is a huge shopping and entertainment complex, as well as the heart of Niagara Park, located in Niagara Falls. The center is visited annually by more than 8 million people who want to enjoy stunning views of the waterfalls that are within walking distance. the southern – in 1974. In the center, there are shops, currency exchange offices, observation platforms, tunnels, fast-food outlets, restaurants with a view of the river and a waterfall, as well as an office for medical assistance. Across the street from the center, there is a paid parking. Interesting: All stores are open daily and year-round, except December 25th. Take into account that in winter, some services are not available. 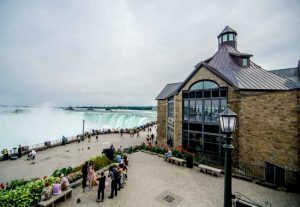 The Canadian city of Niagara Falls is the gateway to the Gypsy Theater of Canada and the starting point of an exciting journey through the Niagara Theaters. Gypsy theater in Niagara Falls was created in 1989, and since then, theater workers have been improving their skills, bringing a significant contribution to the creative and cultural structure of the Niagara region. enjoy a glass of wine in the newly renovated hall built for 200 people. It is never boring here, because the live music and the emotionality of the masters “stir up” even the most passive spectator. Interesting: Classical and modern plays by outstanding playwrights are staged in the theater. Minolta Tower is worth a visit when you plan to go to Niagara Falls. 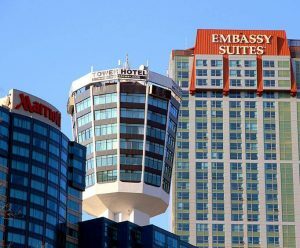 This is the first tower built in the city of Niagara Falls, which undoubtedly offers the best view of the waterfall and the Niagara River. At the top of the tower is the Pinnacle restaurant, which serves international cuisine. The restaurant offers an exceptional menu with a variety of delicious dishes for every taste. There is also a children’s menu. In addition, the tower houses the hotel with magnificent views of the surrounding nature. In addition to the hotel and the restaurant in the tower, there is a wedding chapel in which chic celebrations are organized with excellent memorable photographs. Interesting: Minolta Tower is a landmark of Niagara, built in 1962.
as well as three different artificial ponds. It is an excellent field and sports equipment rental center, an attractive recreation area with a view of the surroundings and an excellent restaurant – you can spend the whole day at the club enjoying the game and a pleasant relaxed atmosphere. In the scenic area is the Royal Niagara Golf Center. It also provides guests with excellent facilities for playing and relaxing. On the phone you can find out the opening hours of the park, ticket prices and other useful information. 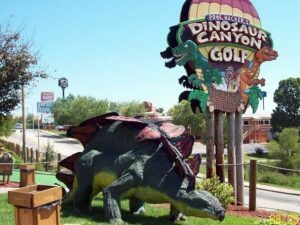 Interesting: This place differs from others in its special thematic focus: here you can see volcanoes everywhere, some of which are even active, and full-size dinosaurs live between them. A modern sound system takes every visitor to the jungle hundreds of millions of years ago. 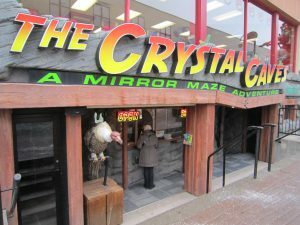 Crystal Caves in Niagara Falls were opened in 1884, when workers, using hundreds of pounds of dynamite, wanted to make their way through the rock to the Niagara Falls train station. During the first explosions of dynamite, the workers realized that they had found something incredible — there were a huge amount of crystals in the deep caves of the rock, so that one could see one’s reflection on the walls. Building a passage through the rock took years, which revealed more and more similar caves. During construction, all entrances to the caves were closed, but a century later, when the railway built earlier burned down during a fire, the caves were again discovered and later opened to the general public as a kind of “attraction”. Now, these endless labyrinths and colorful colored corridors are equipped with everything necessary for visitors and traditionally attract lovers of extreme sports and everything unusual. Children are happy to spend their time here, looking at the huge crystals. Interesting: The caves are open from 9 am to 2 am, the cost of entry is from $ 7 for children to $ 10 for adults. Theater Greg Frewin offers its audience a magic show. The hall of the theater is designed for one thousand spectators. But in the days of the new program, he is able to accommodate more people. So, for all the time of its existence, the theater has been visited by over one hundred thousand people. It bears the name in honor of its leading magician and magician Greg Frewin. He is a multiple winner of various international competitions. Greg Frewin Theater attracts loyal visitors with its wonders. Every time the incredible things take place on the stage. Greg Frewin is a star of the theater. He makes people float in the air. In the theater Greg Frewin, there is a number when a specially trained person passes through a dozen sabers. The audience also likes the performance, during which a person disappears in front of hundreds of spectators. Interesting: By the way, besides the magic show Greg Frewin offers viewers and hearty dinners. But they are not included in the basic cost of a magic show ticket. 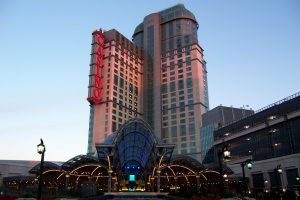 One of the largest casinos in the world, Resort Casino Fallsview, located in Canadian Las Vegas – Niagara Falls, covers an area of more than three football fields – 200,000 square feet! VIP rooms and much more. It should be noted that Resort Casino Fallsview is not only a casino but also its own theater for 1,500 seats, a hotel with 374 luxurious rooms, a fitness center for guests of the complex, more than a dozen restaurants for every taste and budget – from simple eateries to a restaurant luxury, lounge bars and discos – in a word, all so that the players completely forget about real life, having come to relax or cheer up. Interesting: From time to time, casinos hold gaming tournaments – both among beginners and experienced professionals. 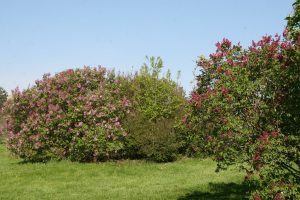 Centennial Lilac Garden, created in 1967 to commemorate the year of Canada, is located not far from Lewiston-Queenston International Bridge. The garden is spread over more than ten acres and contains a collection of more than 1,200 different plants of two hundred different varieties. The garden is most attractive in the second half of May, when all the local plants begin to bloom and smell. In the immediate vicinity of the garden, there is the famous “flower” clock, which is a tourist attraction. Interesting: Built in 1950, the clock is one of the largest in the world – the diameter of the “dial” is over 12 meters, and the flower “face” of the clock is changed twice a season. Check the top-rated attractions in Niagara Falls before planning your trip!